Couches and Chairs…I want some couches and chairs! O.K. friends… About a month ago I sent out a post which stated that I was looking for some furniture. Not one person called… Don’t be embarrassed… We won’t make fun!! I have an old funky furniture fetish and the odder- the better. I know you girls have a couch or chair that you’d just love to get rid of. You know the ones that are in your way and you’ve been dying to get out the garage anyway. Yes even the one with the material that would never be allowed in your house. Call me… If I feel the piece is worthy, we will give you a free sitting here at the studio. We will even pick it up. Send me a photo via e-mail and we’ll be right over. You would be suprised what a beautiful family or darling child can do to an ugly old couch. We know that you are planning a family sitting some time this year for your family. So give us a call before the end of April and when you pay in advance- you will get your sitting half off. That’s right…You can even buy gift certificates for half the price through the end of April. This deal can’t be beat!! Hurry, hurry time is going fast. Exclusions apply: 1 clothing change, One purchase per family, cannot accept multiple coupons. gift certificates apply only to sitting fees. Must be used by October 1, 2008. Up to five people. Must be paid in advance. Mom, Its your lucky day!! Call to schedule your little ones first birthday portrait and we will do it for FREE! just call to schedule your little ones apointment, tell us that it is your childs first birthday, and you won’t pay a thing!! It’s that easy…Oh and by the way…tell all your friends!! 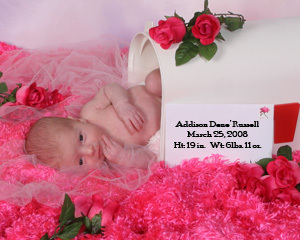 Congratulations to Jason, Rachel, and Llogan Russell on the arrival of your new addition- Addison Dene’. I couldn’t resist buying a white mailbox for this special delivery. She is too, too cute. These images make me smile!! 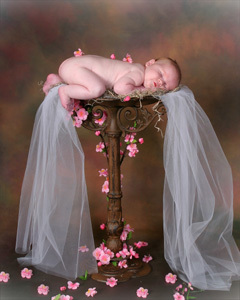 I couldn’t resist this little naked baby in my birdbath! 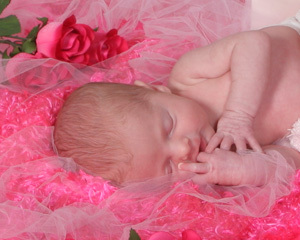 Congrats to Robbie, Liz, Charleigh, and Mavrick Land on your new addition! They don’t come any sweeter than this….